Question: Can multiple logins be associated with the same list of students? Answer: Yes. Each user of an account can have a separate login. If you have multiple coaches, for example, each coach can use their own email address and password to access the website. The logins from multiple coaches may be associated with a single squad. The process begins by each user creating separate logins on the website. Click on the "create new account" link on the login page of any tournament on the website to create a new account. 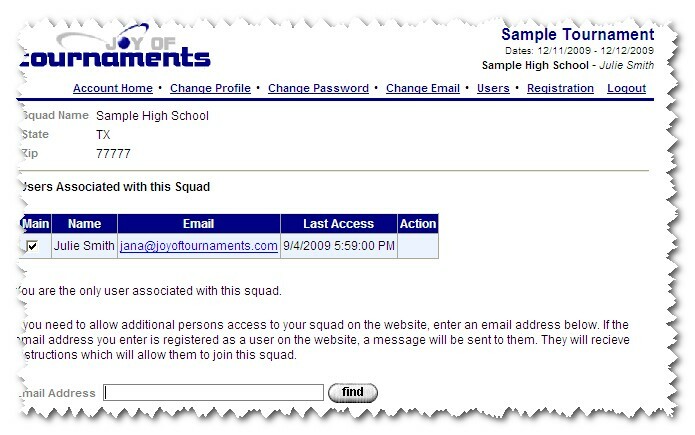 Once the logins exist on the website, the primary account holder may then invite the additional users to join their squad. To do this, find the "My Account" button which will appear near the top of the page along with the regular tabs for [Main], [Squad], [Entries], etc. From the account page, click on the "Users" link. 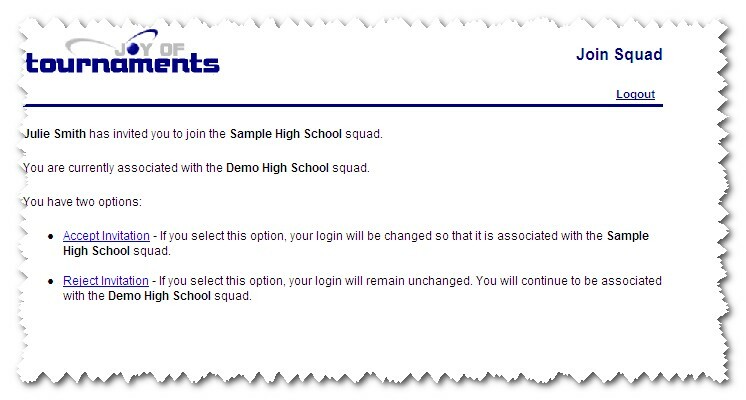 The "users" page will list the various logins which are associated with the current squad. Near the bottom of the page is an option to "find" an existing login which should be linked to the current squad. Type in the email address of the user which should be added to the current squad and press "find". 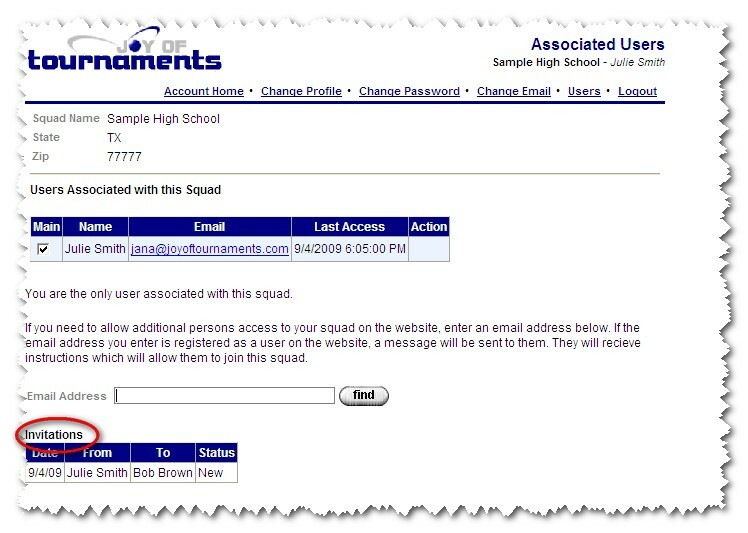 If the website is able to find the email address you've listed, you'll be presented with an option to invite that user to join your squad. If the email address isn't found, then you've either entered the email address incorrectly, or the user doesn't have an existing account on the website. Invitations can only be extended to existing logins on the website. 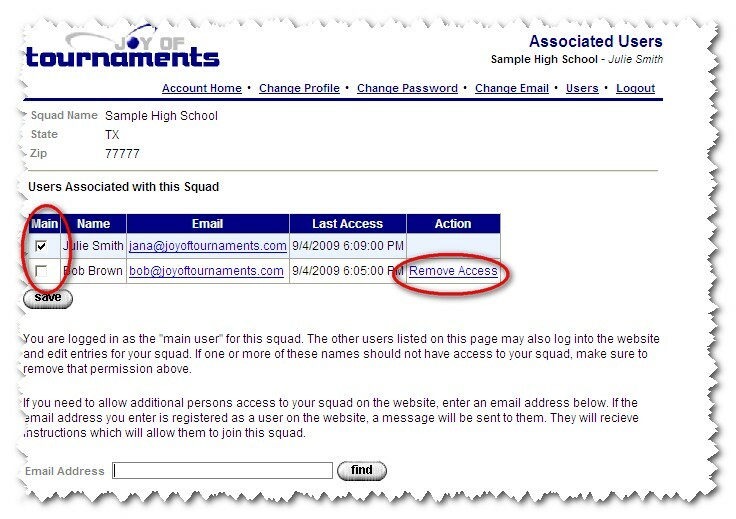 If you confirm that you want to invite the listed email address to join your squad, you'll then be able to monitor the status of that invitation by returning to the "Users" page. The "status" will be shown as "New" until the user returns to the website. Once they respond, you'll see either an "accepted" or "rejected" status. The next time the other user logs in on the website, they'll be presented with an option to either accept or decline the invitation. If the other user "accepts" the invitation, both users will now be allowed access to the same list of students. The "users" page also gives the primary user two other very important options. The "users" page always lists every user that has access to the current squad. The left-most column of the list of users allows the primary account holder to specify which of the various users should be the "main" user. The "main" user is the only user on the account that is allowed to extend invitations to other users. The "main" user is also the only user that can indicate which user should be considered the "main" user. The right-most column provides you with an option to revoke access to various accounts which may have been added to the account but which should no longer have access. For example, if one of the coaches on your squad has changed jobs over the summer, you can remove the access for that coach by clicking on the "remove access" link for that user.